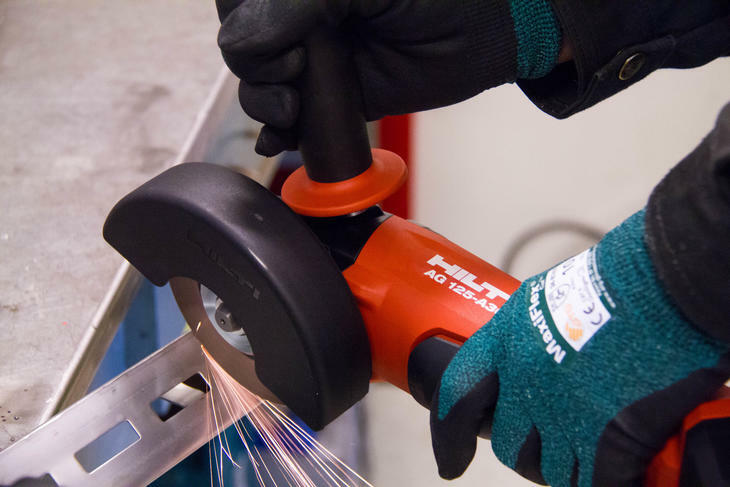 Unless appropriate safety measures are taken, cutting or grinding metal can be a hazardous activity, with risk of personal injury or damage to the installation. Oglaend System’s best practice recommendations for cutting steel products can reduce these risks. Our systems are carefully designed and manufactured using high-tech solutions and modern machine parks. This combination produces a product that typically has no sharp edges prior to cutting. When products are cut on-site for installation, precautions must be taken to avoid accidents and injuries. It is also important to consider local health and safety requirements. Kevlar gloves, goggles, hearing protection, head and footwear protective equipment must be utilised to stay safe when using any of these tools. Local and national HSE variances must also be observed. The correct cutting blade for the material being cut must first be chosen. This is critical to ensure the tool, blade or material does not become damaged, overheat or fail during the cutting process. The correct blade also ensures optimum cutting performance and longevity of the tools. Due to the risk of galvanic corrosion, it is vital to avoid mixing different types of metal such as galvanized carbon steel and stainless steel. Therefore, a single angle grinder disc should never be used on different materials. Nearby products of other steel types should be covered to avoid splatter from the angle grinder that could contaminate the material. 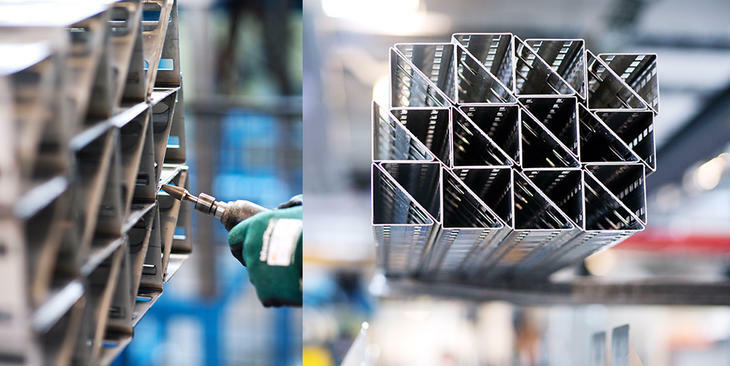 When cutting Mekano® channels, cuts should be made half-way between holes and openings, to maintain the closed section torsional strength and reduce sharp edges. We recommend using Hilti’s cordless saws for cutting our steel products. They are accurate and offer flexibility that does not compromise on safety. 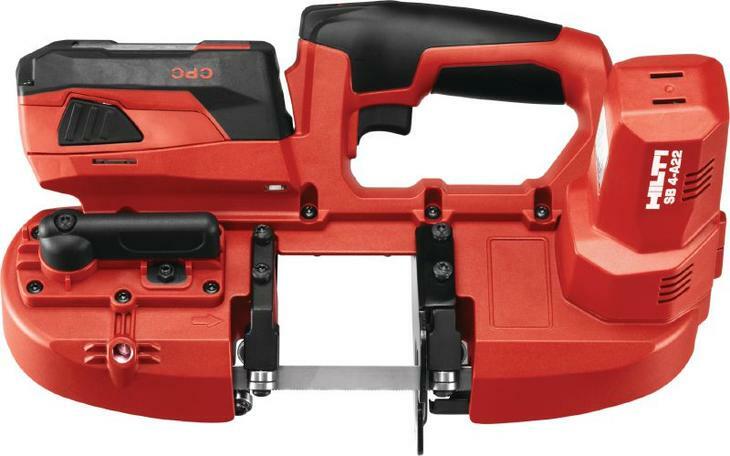 A circular saw is a good option for cutting light channels, cable tray and ladders. The Hilti SCM 22-A circular saw is precise, cordless, easy to handle and has a chip collector to reduce contamination potential. The blade of Hilti’s circular saw is guarded for the safety for the worker. It is also equipped with a blade brake that stops the blade in less than 0,5 seconds. The LED lamp in the front section of the blade guard illuminates the cutting line, making it suitable for any environment. Hilti’s cordless bandsaw is an appropriate tool for cutting low height, thin metal products such as cable ladders and trays and support channels. Accurate cutting is achieved with low noise and debris. Hilti SB 4-A22 has a cutting capacity of 63.5 mm. Where other options are impractical, angle grinders may also be used. These offer increased flexibility, but result in more splatter. Care should be taken to protect surronding materials from grinding sparks, and to avoid overheating the materials. Cutting using torches is not recommended, as surface treatments become damaged and the materials may be weakened. After metal has been cut, all sharp edges should be deburred to avoid cutting injuries to personnel. End caps are also available in high visibility thermoplastic or in all metal construction. By following our guidelines and Hilti tool recommendations, it could positively enhance HSE when cutting Oglaend System steel products.